Amol Gulhane, Robolab CoFounder is awarded as Innovator who changed the Startup World - Robolab Technologies Pvt. Ltd. The most important aspect for any business is planning. It helps an organization chart a course for the achievement of its goals and Robolab is a perfect example for it. Robolab Technologies Pvt. Ltd. was officially incorporated on Friday the 13th September 2013. The team of Robolab had already started working on the business model and planned well before its establishment. For almost 5 months, the team of Robolab met several institutions in and around the region, but they got rejected for not having prior business experience. But as it is rightly said, “Never Lose Hope”, and they did not lose one, instead, they left their comfort zone and started approaching early majority institutions all over India with their solutions. The pool was large and it was needed for them to target somewhere and thus, they chose Andhra Pradesh and began approaching Professors and HoD’s of top colleges. Within two months of starting this exercise, they succeeded in breaking the ice. They got their first order from the Guru Nanak Institutions, Hyderabad. At the initial stage, all Robolab needed was the necessary momentum and that’s what the first order gave them. Since then, they have never looked back, and within a short period of 4 years, Robolab has reached 28 key institutions spread across 10 states in India and has collaborations with Indian Armed Forces and various Industries. Robolab Technologies came into existence out of the rigorous efforts of its founders as an attempt to transform the Educational facilities in the country, provide an innovative platform to the students to show their skills and implement their ideas and create employment for the youth. Instead of taking up lucrative jobs, the founders chose to start a company. Having worked in the Robotics field for four years of their Engineering and being associated with the Robotics and Automation Laboratory- Robot Study Circle in COEP, Robolab Technologies was bound to happen. Having worked on a variety of projects, participating in various types of competitions and securing laurels for the Alma Mater at all levels, the founders decided to continue with the same zeal and impart the knowledge to the newcomers and other students. Born and brought up in Yavatmal District of Maharashtra state, Amol Gulhane is the Co-Founder and CEO of Robolab Technologies. He is a first generation entrepreneur and a Roboticist Shaping the Best Robotics and Automation Company. Amol has completed his B.Tech in Electronics and Telecommunication from Govt. College of Engineering, Pune (COEP). A roboticist, Amol has deep experience of designing and manufacturing complex and task specific industrial robots. He has a profound knowledge of educational and defense robots and is specialized in digital image processing, embedded programming, design analysis and optimization. With his entrepreneurial, management and technical skills and being an accomplished sports-person, he implements his unique ways to motivate the entire team and get the best out of people. Amol plays the most vital role in shaping Robolab. Amol advises to the budding entrepreneurs to be open for new ideas and other perspectives as many a times, We do not see the things as they are, We see them as We expect them to be. 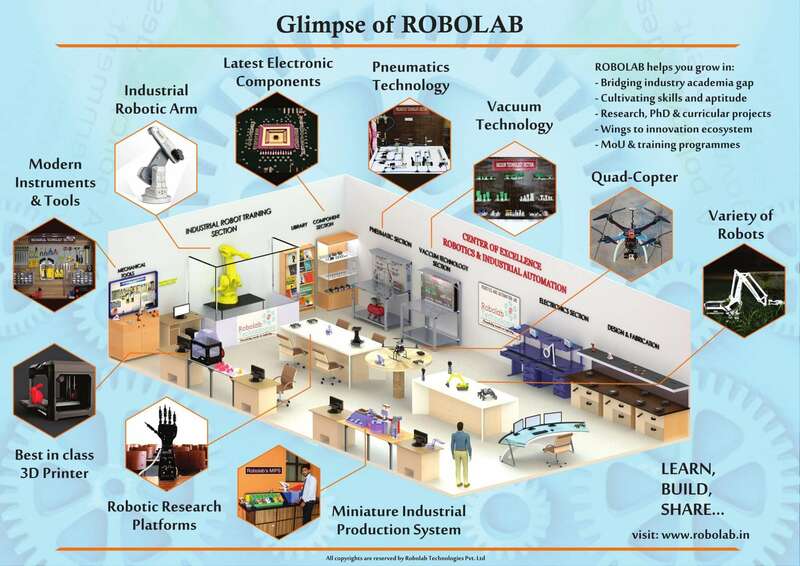 Robolab is your very own, on campus, Center of Excellence in Robotics, Industrial Automation, and Internet of Things. Equipped with all the advanced technologies used in industries, it offers training courses consistent with the latest curricula and the industry requirements. Thus, functioning as the perfect platform for its users (students as well as teachers) to explore, learn, build and share their ideas. Robolab believes in providing innovative and interactive training by industry experts. This empowers the trainees to manage the Robolab in future. Some of the primary product features include advanced state-of-the-art technical research facility within a campus, hands on practical experience along with required theory, consolidation of concepts, Industry-Institute Interaction, standard guidelines and essentials, training by industry experts, superior quality and advanced robot study platforms, and affordable excellence. Technology solutions for defense, industrial, domestic and other social problems. The biggest challenge Robolab faced is the limited support mechanisms from the Government and Banks Institutions. They say, “Finding the right team who can share the same passion as the founders is the most challenging part.” So far Robolab has succeeded in that. The core team of Robolab consists of all Engineers. So the challenge for them was understand the money flow as only knowing the regular profit and loss statement of the business is not enough. Although it may appear that you are breaking even on paper, the situation can be entirely different. Family members, Friends, Mentors from Bhau Institute and COEP who stood by Robolab during the testing times are the biggest strength of the company. “The most important part of any company is its customers and your team. Both are equally important. You have to maintain a perfect balance between requirements and needs of your customers as well as your team, and Robolab does it flawlessly with pride,” says Amol Gulhane. In the coming future, Robolab will be seen diversifying to different market segments of the education (Primary Schools to Post-Graduate Research Organisation), bringing out the innovations and products from the institutions to the market, and at least a 10 fold rise in the number of beneficiaries associated with Robolab. Increasing presence of technology and automation around the globe is calling Robolab for the beat times ahead.